Diana, Princess of Wales understood the power of her role in the public’s eye, and used that understanding to change attitudes to important issues of the day. She is remembered for her devotion to all the causes she supported, but particularly for her championing of unpopular causes – such as those suffering from HIV/AIDS, those afflicted by leprosy and those whose lives had been devastated by landmines. 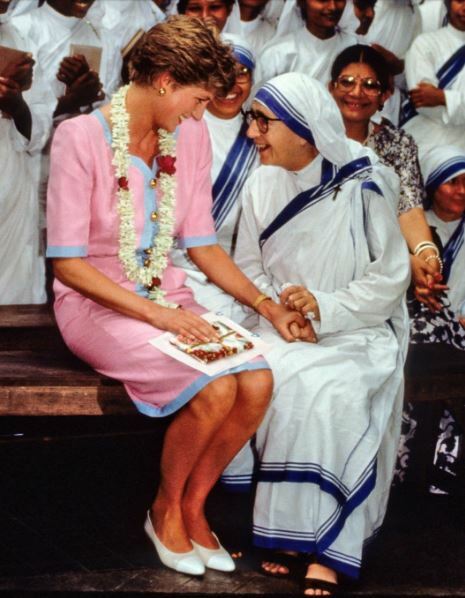 In February 1992 the Princess visited Mother Teresa’s Hospice for the Sick and Dying in Kolkata, India, and visited every one of the 50 patients who were close to death. In Rome shortly afterwards, and later in London and New York, she met Mother Teresa and the two formed a strong personal connection. 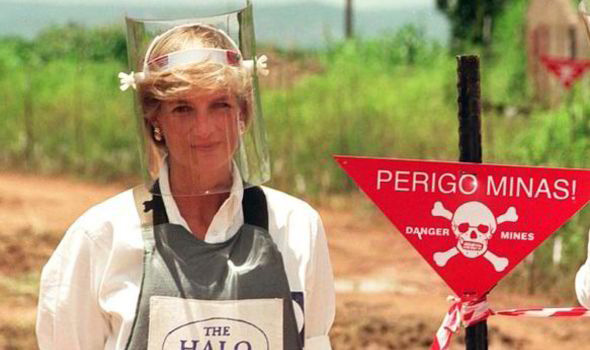 In the late 1990’s Diana campaigned to ban the use of dangerous landmines. 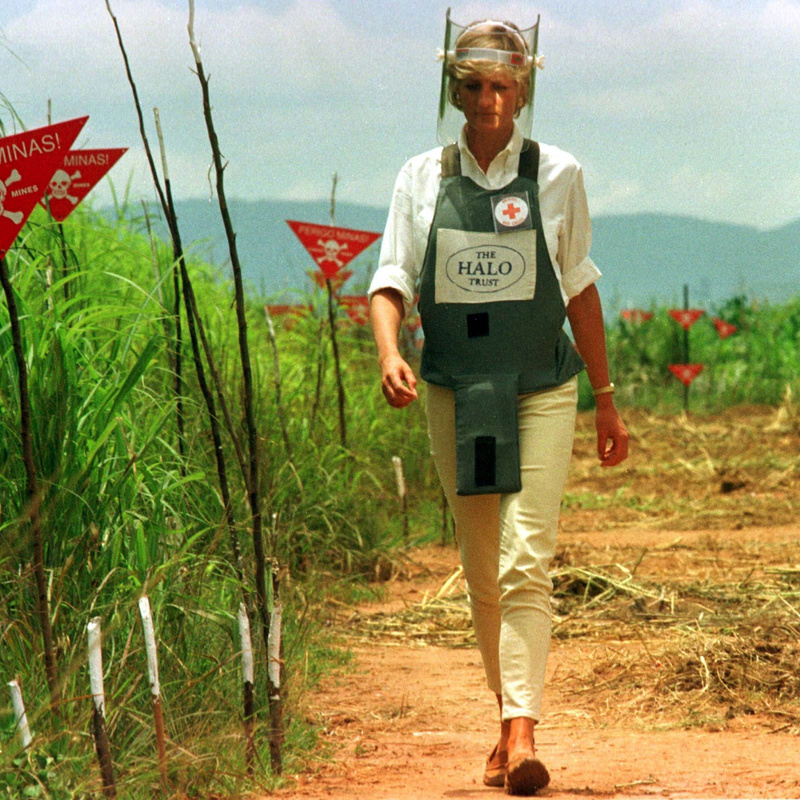 In 1997, as a volunteer for the International Red Cross she visited Angola with The Halo Trust to raise awareness about the devastation that landmines cause, particularly the atrocious injuries suffered by children. Photos of Diana walking across a live minefield in Angola and talking to the local people were seen all over the world. Many people don’t know, but, the press missed the first time she walked through the minefield and Diana had to do it again so they could capture it on film! Diana was once again credited with being an international influence as a year after her death, the Ottawa Treaty was signed to internationally ban the use of landmines by 161 member states. Photos of Diana walking across a live minefield in Angola and talking to the local people were seen all over the world. Many people don’t know, but, the press missed the first time she walked through the mine field and Diana had to do it again so they could capture it on film! Diana was once again credited with being an international influence as a year after her death, the Ottawa Treaty was signed to internationally ban the use of landmines by 161 member states. 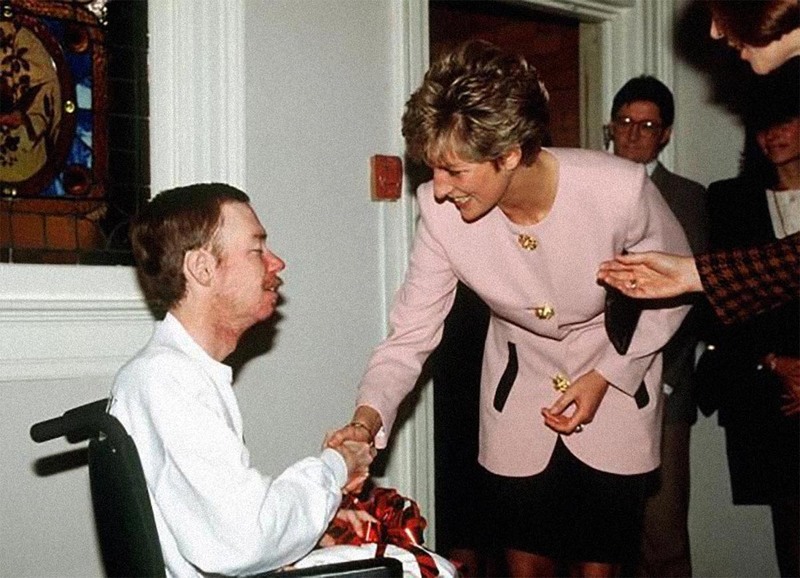 In 1987 at the age of 26, Diana was photographed shaking the hand of an AIDS patient and even more significantly, without gloves. It may be hard to believe now, but this simple gesture was ground-breaking to the stigma that was at the time attached to AIDS. During its outbreak in the 1980’s, no one would touch someone afflicted with the disease or even be in the same room as them for fear of being infected. 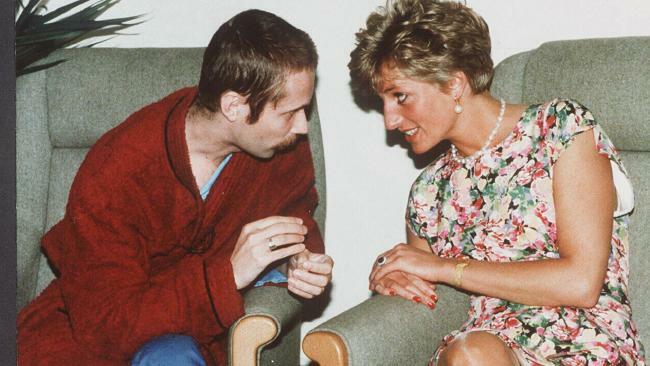 Of course this belief was incorrect and with one simple act of holding a patient’s hand, Diana began a conversation and educated the world about compassion, love and understanding all while breaking down the stigma attached to the disease and its sufferers.